Tuberculosis (TB) is preventable and curable, yet it remains one of the most common infectious diseases worldwide. In Canada, rates of TB are low; however, there is greater incidence among Canadian Indigenous people and among foreign-born individuals from countries where TB is common. Today, the Honourable Jane Philpott, Minister of Health, announced funding to expand the Taima TB 3HP Study. The study aims to assess the feasibility and cost-effectiveness of a shorter course of treatment for latent TB infection among persons at increased risk. The study will also assess whether more people will start treatment and complete full treatment for latent TB infection if the treatment is shorter. The first phase of the study is currently underway in Iqaluit in partnership with the Ottawa Hospital Research Institute, the Government of Nunavut, Nunavut Tunngavik Inc. and Inuit Tapiriit Kanatami. The second phase of the study — led by the Ottawa Hospital Research Institute in partnership with Ottawa Public Health and the Children’s Hospital of Eastern Ontario — will replicate the northern study with communities in Ottawa. Latent TB is a condition in which TB bacteria are alive but inactive in the body. During this time, people have no symptoms, do not feel sick, and cannot spread TB to others. The standard treatment of latent TB infection consists of daily treatment for nine months. In recent years, shorter treatment regimens have been developed with the aim of increasing rates of treatment acceptance, compliance and completion. The shortest and most recently developed treatment regimen is 3HP, which is taken once weekly for 12 weeks. The TB 3HP study will contribute to the knowledge base that currently suggests that 3HP is a promising alternative to existing treatments for latent TB. The Government of Canada is investing $196,940 in the second phase of the Taima TB 3HP study. This is in addition to $400,000 provided to support the first phase of the study. Recent data show that of Canadians with active cases of TB about 17% are Canadian Indigenous people, and 71% are foreign-born people. The infectious form of the disease is known as active TB disease and is curable. It requires appropriate medication and strict adherence to treatment to treat the infection and prevent drug resistance. Latent TB infection is not infectious, but if not appropriately treated it can develop into active TB disease. Identifying and treating latent TB infection in individuals at high risk of developing active TB disease is important to lessen the burden of this disease for individuals and to prevent further spread of infection. 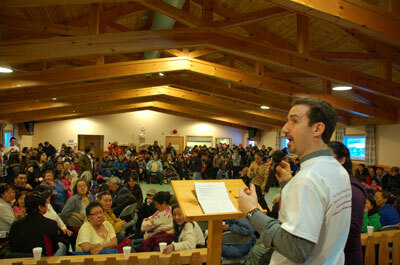 Photo: Dr. Gonzalo Alvarez speaks about TB at a community feast in Nunavut.